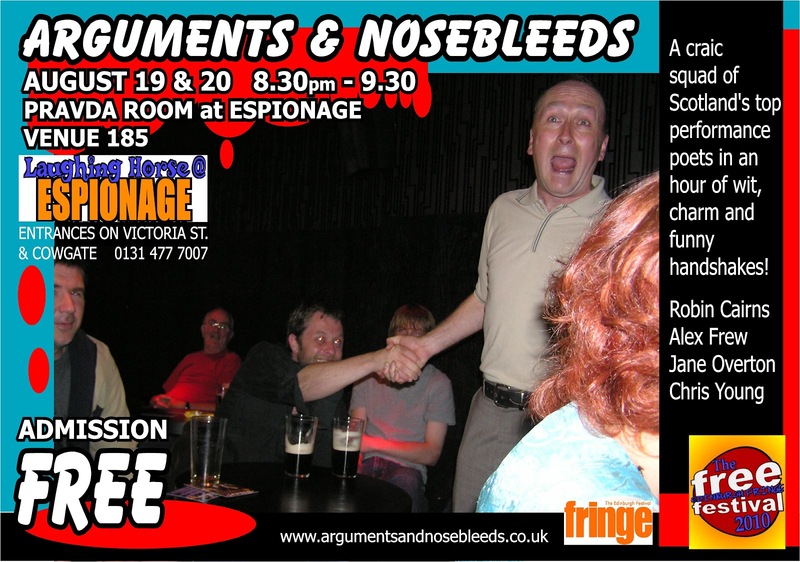 2010 saw the launch of Arguments and Nosebleeds when Jane Overton invited Robin Cairns, Alex Frew and Chris Young to help her take Edinburgh by storm (or at least by squall). We started with a run of just two nights. Jane showed dogged determination in the face of consumer culture, Robin introduced us to corporal punishment and boy bands, Alex defied Darwinism with the aid of a guitar, and Chris spoke a lot of bull then took his trousers off. Just how a night of spoken word should be. 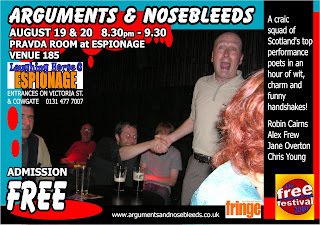 But Arguments and Nosebleeds wouldn't have been the same without its special guests. Indeed, we were different each night. On Thursday we were joined by the 2010 Aye Write! Scottish Slam Champion, Milton Balgoni, who plucked poetic gems and burnished gold from places the sun rarely reaches. And on Friday we were bolstered, entertained, serenaded and generally overwhelmed by the needs-no-other-introduction John Hegley. So, a good time was had by all - all for FREE.